Tonight is the night we've been waiting for! 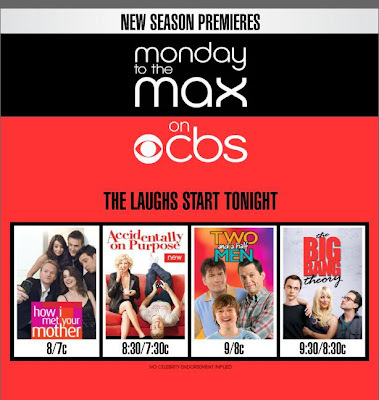 Fall Premieres on CBS - How I Met Your Mother at 8:00 followed by the premiere of the new Accidentally on Purpose at 8:30. At 9:00pm the hilarious Two and A Half Men followed by The Big Bang Theory at it's new time 9:30.